How the portal vortex is affecting the energy market. Over the past three weeks, we have seen considerable contraction in the storage deficit due to repeatedly low levels of withdrawals from underground storage. In fact, the average rate of net withdrawals from storage is a whopping 31% lower than the five-year average so far in the withdrawal season (there are, however, 9 weeks remaining). During that same timeframe (that is, the past three weeks), the price of natural gas has remained as volatile as ever, as drastic price variances have piggy-backed on sudden and extreme shifts in the short-term weather outlooks. Following a very warm first few weeks of January, we saw the prompt month settle move down from the $3.50-$3.60 levels witnessed in late December, to $2.90. Again, the subdued heating demand and accompanying paltry withdrawal figures have kept prices depressed at or around the $3 mark, until last week when a severe cold due to the polar vortex approached and a major snowstorm settled in across the Midwest and Northeast. In a predictable corresponding move, the February natural gas contract ballooned to above the $3.50 level. 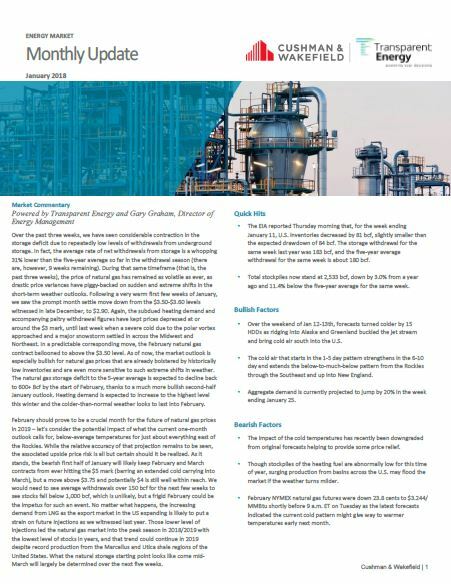 As of now, the market outlook is especially bullish for natural gas prices that are already bolstered by historically low inventories and are even more sensitive to such extreme shifts in weather. The natural gas storage deficit to the 5-year average is expected to decline back to 600+ Bcf by the start of February, thanks to a much more bullish second-half January outlook. Heating demand is expected to increase to the highest level this winter and the colder-than-normal weather looks to last into February. Other important energy market news. – The EIA reported Thursday morning that, for the week ending January 11, U.S. inventories decreased by 81 bcf, slightly smaller than the expected drawdown of 84 bcf. The storage withdrawal for the same week last year was 183 bcf, and the five-year average withdrawal for the same week is about 180 bcf. – Total stockpiles now stand at 2,533 bcf, down by 3.0% from a year ago and 11.4% below the five-year average for the same week. – February NYMEX natural gas futures were down 23.8 cents to $3.244/MMBtu shortly before 9 a.m. ET on Tuesday as the latest forecasts indicated the current cold pattern might give way to warmer temperatures early next month. To learn more about these developments and to get the latest prices, trends, data highlights, and temperature probabilities read the full energy update.